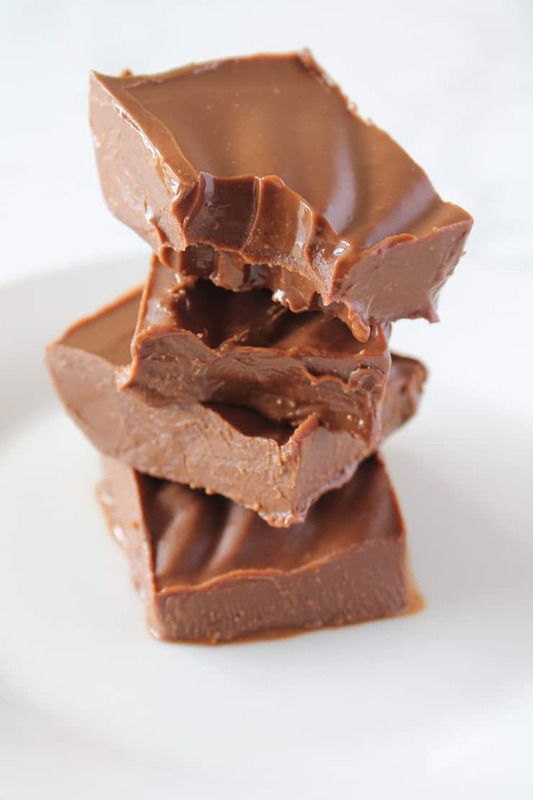 This 3 ingredient chocolate keto fudge is an easy paleo and vegan dessert recipe. It has a solid yet soft creamy texture and a rich sweet chocolatey flavor. I always remember fudge being one of my favorite desserts as a child. On any special outing to the county fair or to the seaport my family would indulge in the chocolatey treat. But when you are committed to a healthy lifestyle, fudge isn’t exactly part of the menu. I wanted to create a healthy keto fudge that is easy to make and suitable for paleo or vegan diets. With this recipe you can indulge in a sweet dessert that doesn’t make you feel terrible afterwards! This recipe is simple and easy. It only has 3 ingredients and the prep work is quick. The hardest part of the recipe is just waiting for it to solidify in the refrigerator or freezer! Luckily, because of the coconut oil, it solidifies pretty quickly. 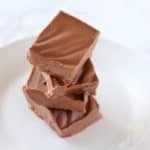 This keto fudge is sugar free so it’s a great option for anyone on a sugar detox or doing the keto diet. The flavor and texture complement each other to create a delicious treat! It’s creamy and chocolatey with a hint of nuttiness that melts in your mouth. I have only used cashew butter for this recipe because I find that it really adds to the creamy flavor and texture. Cashews are often used to add richness to dairy-free dishes, so that’s why I use it here. I find that cashew butter that is only 100% cashews in the ingredients list works best. Some places sell cashew butter with added oils that can make the texture too oily. I have not tried using other nut butters like almond butter in place of it, so i can’t be sure if it would turn out the same. If you experiment with this, please leave a comment and let us know how it turns out! I use stevia sweetened chocolate chips for this recipe to keep it sugar free and keto friendly. You can substitute these for any type of chocolate chip if you don’t want it to be sugar free. I prefer to use virgin coconut oil for this recipe, but any type of coconut oil will do. I use coconut oil because it is solid at room temperature and solidifies in the fridge quickly. Because of this, most other oils won’t work as a substitute. I find it works best to use a double boiler to melt the chocolate and coconut oil so you don’t run the risk of burning the chocolate and getting an acrid flavor to it. 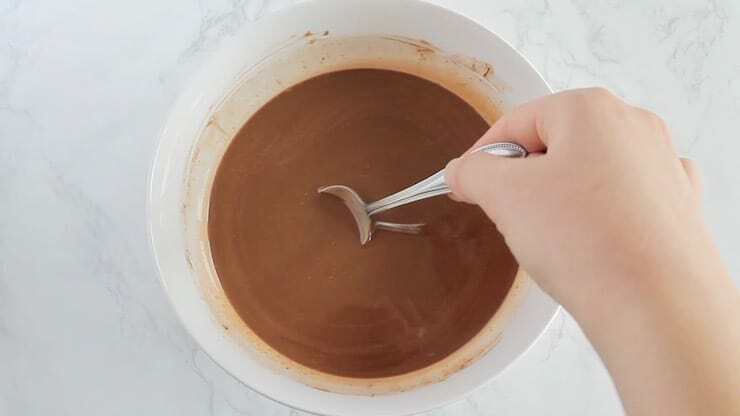 A double boiler is when you fill a pot with boiling water then place a heat-safe bowl on top of the pot and put the ingredients in the bowl so it’s not directly on the heat source. It will work if you just heat the ingredients in a pot without the double boiler, but just be sure not to have the heat too high and continually stir it until it’s melted then remove it from the heat so it doesn’t burn. I have outlined a few minor substitutions that would work for this recipe in the bullets above, but most major substitutions likely won’t work. If you do experiment with this recipe, please leave a comment and let us know how it turns out to help others who may want similar substitutions. Make sure you store this keto fudge in the refrigerator or freezer. 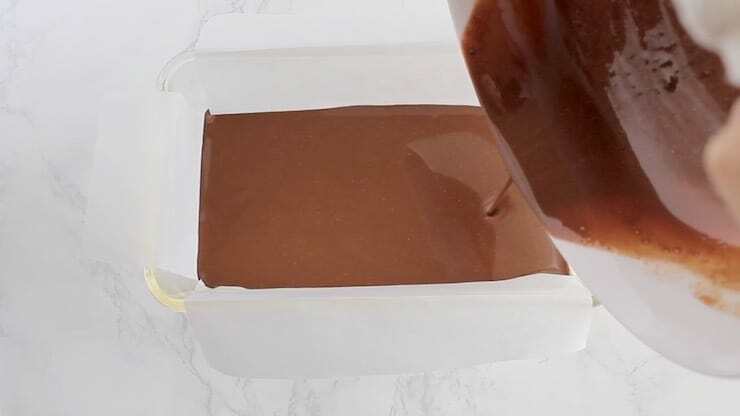 Since a large part of the fudge is made up of coconut oil, and coconut oil melts at 76°F, it’s important to keep it cool so it doesn’t melt. It can be kept at room temperature for a bit as long as it’s not too hot. This fudge will last quite a while in the freezer–probably a month or more, but in my experience it never stays around that long without getting eaten! Combine all ingredients together in a heat safe bowl. Melt ingredients using a double boiler method (see recipe notes for more details). Pour the melted mixture into a 9×5 inch loaf pan lined with parchment paper. Refrigerate or freeze until it has hardened. It can take anywhere from 20-60 minutes. Then slice, serve and enjoy! Treat Yo Self! 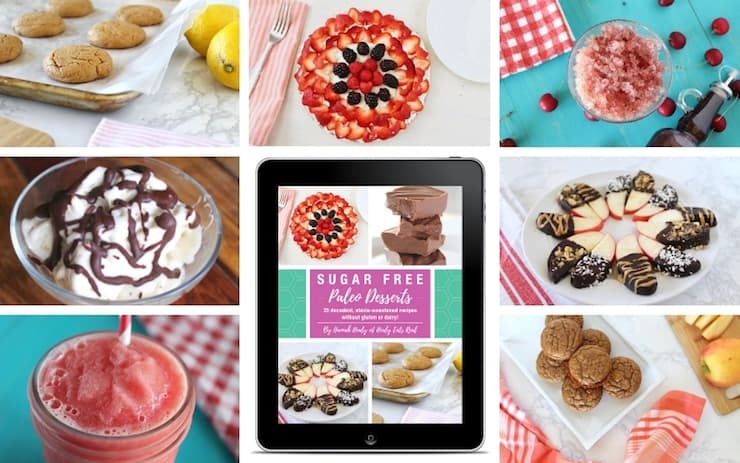 You owe it to yourself to have a delicious treat without having to resort to unhealthy processed sugar-laden desserts! 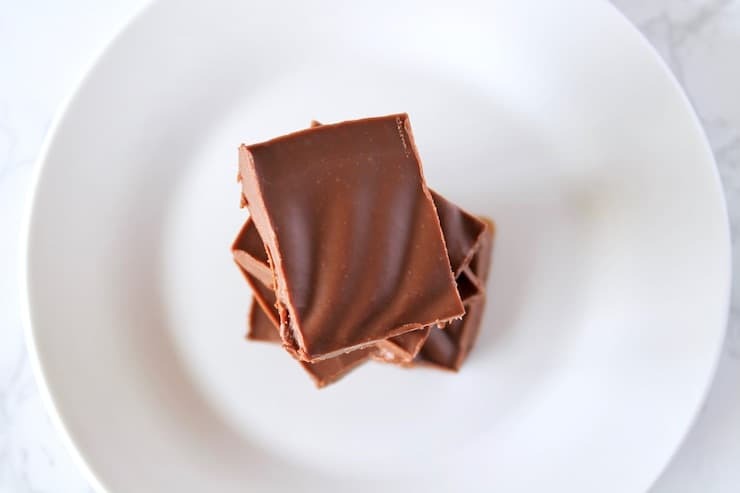 Did you like Rich 3 Ingredient Chocolate Keto Fudge (Paleo & Vegan)? Don’t forget to rate the recipe and leave me a comment below. You can also follow me on Facebook, Instagram, Pinterest! Place all ingredients together in a double boiler on medium heat until it becomes a liquid. Stir to evenly distribute. Place parchment paper in a 9 x 5 inch loaf pan and pour mixture into pan. Refrigerate or freeze until hardened, then cut into about 10 pieces. I have only used cashew butter for this recipe because I find that it really adds to the creamy flavor and texture. Cashews are often used to add richness to dairy-free dishes, so that's why I use it here. I find that cashew butter that is only 100% cashews in the ingredients list works best. Some places sell cashew butter with added oils that can make the texture too oily. I have not tried using other nut butters like almond butter in place of it, so i can't be sure if it would turn out the same. If you experiment with this, please leave a comment and let us know how it turns out! I use stevia sweetened chocolate chips for this recipe to keep it sugar free and keto friendly. You can substitute these for any type of chocolate chip if you don't want it to be sugar free. 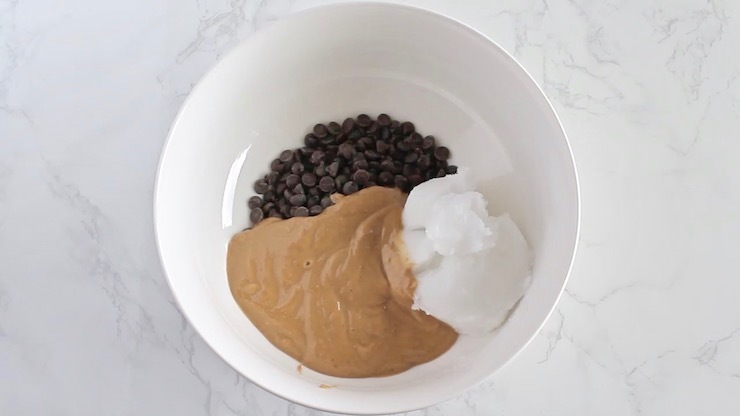 I prefer to use virgin coconut oil for this recipe, but any type of coconut oil will do. 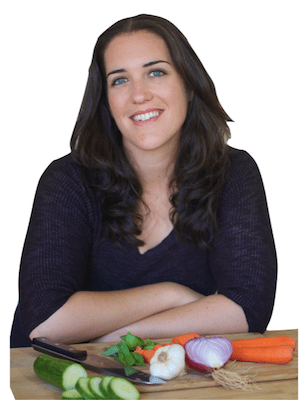 I use coconut oil because it is solid at room temperature and solidifies in the fridge quickly. Because of this, most other oils won't work as a substitute. I find it works best to use a double boiler to melt the chocolate and coconut oil so you don't run the risk of burning the chocolate and getting an acrid flavor to it. A double boiler is when you fill a pot with boiling water then place a heat-safe bowl on top of the pot and put the ingredients in the bowl so it's not directly on the heat source. It will work if you just heat the ingredients in a pot without the double boiler, but just be sure not to have the heat too high and continually stir it until it's melted then remove it from the heat so it doesn't burn. I have outlined a few minor substitutions that would work for this recipe in the bullets above, but most major substitutions likely won't work. If you do experiment with this recipe, please leave a comment and let us know how it turns out to help others who may want similar substitutions. 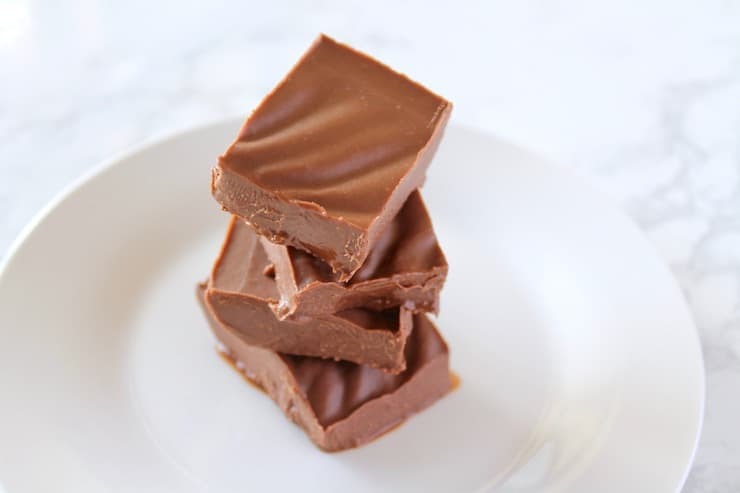 Make sure you store this keto fudge in the refrigerator or freezer. Since a large part of the fudge is made up of coconut oil, and coconut oil melts at 76°F, it's important to keep it cool so it doesn't melt. It can be kept at room temperature for a bit as long as it's not too hot. This fudge will last quite a while in the freezer--probably a month or more, but in my experience it never stays around that long without getting eaten! For net carbs, be sure to subtract an extra 2g of sugar alcohol per serving. 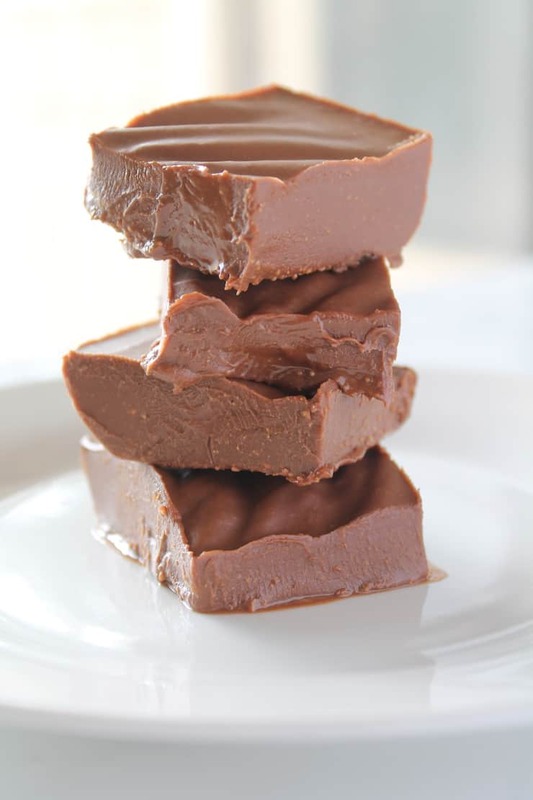 One serving of fudge has about 5 grams of net carbs. Oh my word! This looks positively HEAVENLY! Cannot wait to try! Thank you! Hope you enjoy! They are one of my favorites! Looks so delicious! The perfect treat to satisfy a sweet tooth! Absolutely! It’s a great one to keep in the freezer when you want a treat! Quick, easy and delicious! Really like the idea of using cashew butter. 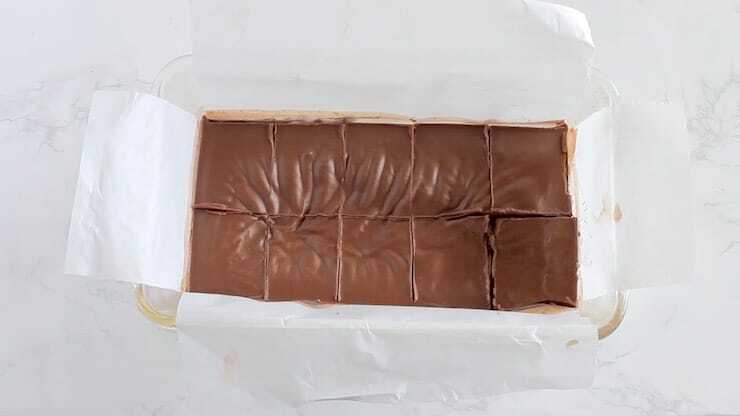 I could so go a piece of this fudge right now! I can’t believe it has only 3 ingredients, wow it looks so smooth and delicious, can’t wait to try. Cheers! This looks so good! I love fudge, and cashew butter is so good as well. Yum! Never made cashew butter but if you can go into something like this I’ve got to do it ASAP. You can also buy cashew butter! It makes it easier! You can get them on amazon (there’s a link to it on the ingredients list) or you may be able to find them at a local health food store like whole foods. I made this exactly as you said and it’s beyond delicious! Melts in your mouth! Awesome! Thanks for sharing Tammy! So glad you enjoyed it! I forgot to mention that I used sugar free chocolate chips, as stevia chocolate chips are not available where I live and I didn’t want to wait! I’m making these with almond butter right now! I only had pb, so I had to try! Andrew nom nom nom!!!!!! 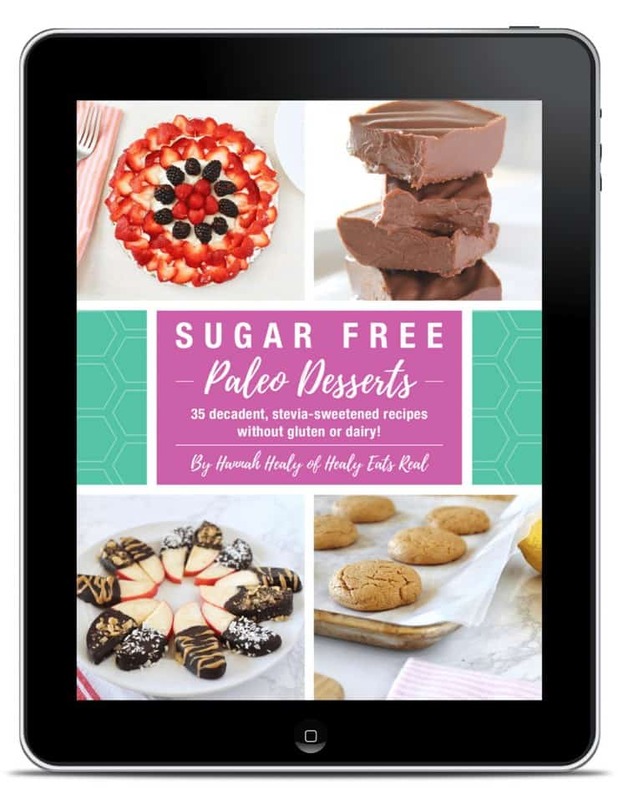 My On has 2 g of sugar- keto approved pb… so it works and tastes wonderful!!!! Thk u!!! I made these with cashew butter that had added sunflower oil as that was the only pre-made kind I could find in my area. I slightly reduced the amount of coconut oil and they turned out perfectly! Just made this fudge tonight. I used regular Natural Peanut Butter since that’s all I had. It turned out pretty good and will surely help my chocolate cravings. Can really taste the coconut flavor but not sure if that’s because I used peanut butter instead of almond butter. But was still good. And it’s so easy. Glad I came across this recipe. Thank you! Glad you enjoyed it! If you prefer a less coconut flavor, you can use refined coconut oil which doesn’t have the coconut flavor. thanks for the tip. I’m attempting Keto and am not a huge fan of coconut.